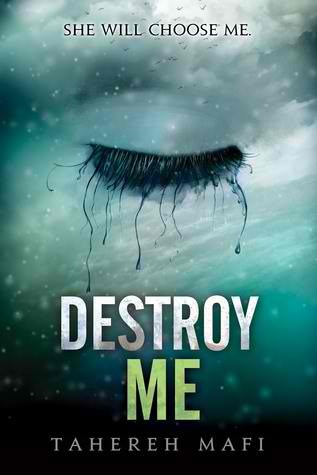 I finally got around to reading Destroy Me by Tahereh Mafi since the release date of Unravel Me is just around the corner. The novella is told in Warner's POV and occurs after the events that took place in Shatter Me. First of all, if you're looking for some Warner and Juliette action them this might just do it for you. Haha. There's a bit of that here. I love reading from the male POV's especially one's whose minds are as twisted as Warner's. Don't ask me why. I just do. Anyhoo, I loved getting to know Warner more in this novel. I actually think he's just a sad boy who wants and needs to be loved. He's not actually as twisted as everyone thinks. Destroy Me actually made him seem like a decent human being. Yes, he's ruthless and twisted but he also has a soft side. Anyway, this just going to be a very short review since this is only a novella but I did love it. I think this is a good bridge between Shatter Me and Unravel Me. Makes you think what's in store for Warner, Adam and Juliette. same here. I want more. I actually realized just now how obsessive compulsive Warner is. Haha. Seriously, the guy defines the term neat freak. Tahereh Mafi will be visiting Manila this March. Can't wait to meet her.